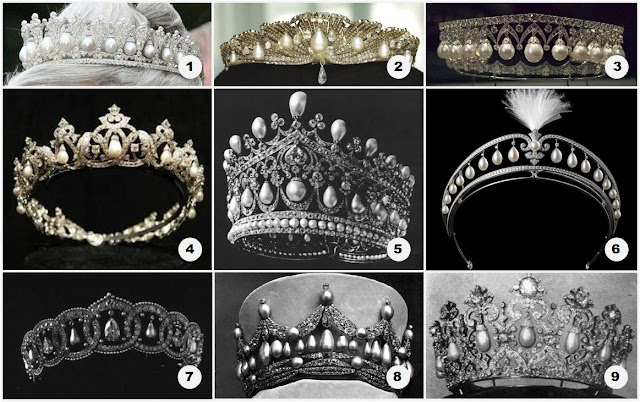 The Royal Order of Sartorial Splendor: Readers' Ultimate Tiaras: Pick Your Pearls! Pearls are a staple in a royal jewel vault, don't you agree? 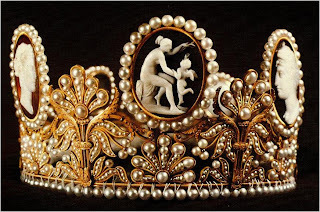 Most of the major royal collections have at least one pearl tiara at their disposal, and many have multiple options. Obviously, special space in your ultimate tiara collection should be devoted to pearls - two spaces, to be exact. 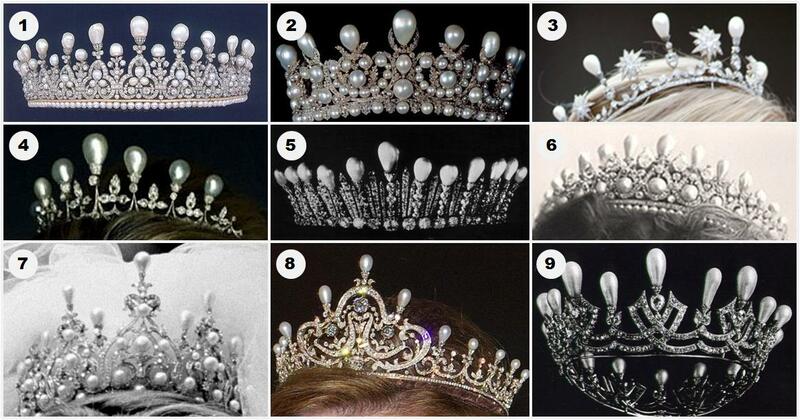 Pick your ultimate pearl drop tiara! Pick your ultimate standard pearl tiara! Pearl drop tiaras are defined here as those with dangling pearl drops. It's quite a popular tiara design, these pearl pendants swinging from diamond frameworks, with plenty of examples to pick from. The British collection offers two prominent examples. The Cambridge Lover's Knot was originally made as a replica of another tiara. It shouldn't be a surprise, then, to learn that there are multiple lover's knot tiaras out there with close to identical designs. And there are more out there, of course. Second, I'll ask you to choose a regular pearl tiara - one that doesn't include dangling drops, but does include pretty much whatever else you like. Upright drop pearls are always popular. Round pearls work as toppers, too. Or you can just incorporate them any which way you please. And seriously, that's just the tip of the iceberg. I mean, this doesn't even include things that go beyond your standard diamond and pearl pairing, like the Cameo Tiara, or the Portland Sapphire Tiara, all of which are fair game if you like! But I'll leave you here. Programming note: The blog is on vacation next week. (I'll still be posting at the Jewel Vault, where it will be a busy week for the Queen.) I will put up an open post on Monday for those of you that would like to chat while we're on hiatus so we can keep that separate from the voting, make it a little easier for me in the tallying stage. I'll leave this post open until Wednesday for voting. UPDATE: Thanks for all your contributions, voting is now closed!